Learn all about the history and culture of t'ej – and how to make it. SCIENTISTS, ECONOMISTS AND SOCIOLOGISTS – in Ethiopia and from around the world – have recently come to recognize the importance of honey, bees and homebrew t’ej to the Ethiopian culture and economy. Here’s a roundup of the reports and studies they’ve published, along with links to some of the articles. ♦ A study conducted in 2001, and published in The Journal of Food Technology in Africa, examined the chemical and nutritional properties of t’ej. In this study, Bekele Bahiru, a professor on the faculty of science at Addis Ababa University, analyzed 200 samples of t’ej made at different times and in different places. “As t’ej fermentation is a spontaneous process that depends on microflora naturally present on the substrates and equipment,” he writes, “the different metabolic products of the randomized microflora at different stages, the physical and chemical environment, duration of fermentation and concoction practices would result in physico-chemical variations in the final product.” In short: No two glasses of t’ej are exactly alike. Bekele notes in his introduction that virtually every culture in the world has an indigenous fermented beverage, and in Africa, such beverages are often used at important occasions like “marriage, naming and rain making ceremonies, at burial ceremonies and settling disputes.” He then says that “good-quality t’ej is yellow, sweet, effervescent and cloudy due to the content of yeasts. The flavor of t’ej depends upon the part of the country where the bees have collected the nectar and the climate.” His study goes on to find that the pH of t’ej ranges from 3.02 to 4.90, making it decidedly acidic. The alcohol content of his samples ranged from a mere 2.7% to a hearty (for wine) 21.7%. 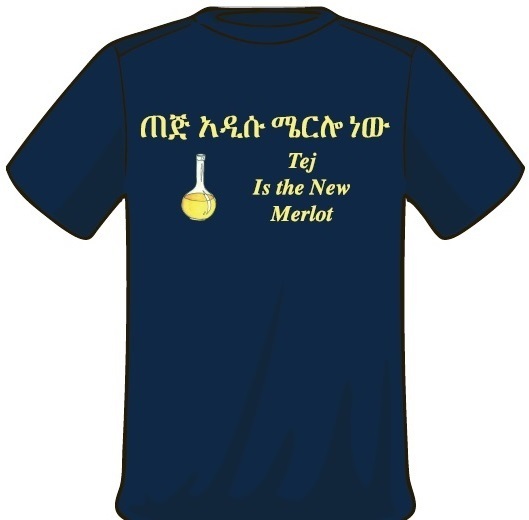 T’ej has fewer carbohydrates than European honey wine and more proteins than grape wine. Read the report. 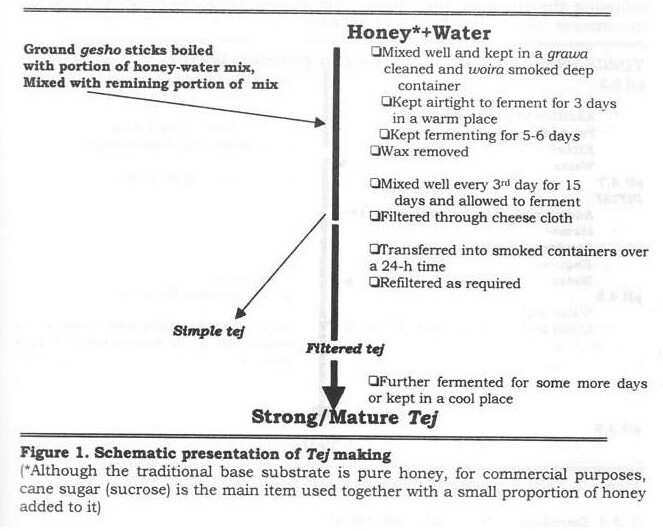 ♦ Bekele’s 2005 study in the journal Food Microbiology again looked at t’ej for its yeast and lactic acid content. The research concludes that yeasts of the species Saccharomyces cerevisiae make up 25% of the yeast that ferments t’ej, while three other yeasts do 40% of the work between them. And Bekele reveals one of the secrets of t’ej. “Some t’ej makers also add different concoctions such as barks or roots of some plants or herbal ingredients to improve flavor or potency,” he writes. “Due to concoction, adulteration practices and possibly some other reasons, producers usually are not willing to tell about additives used and their compositions.” Read the report. 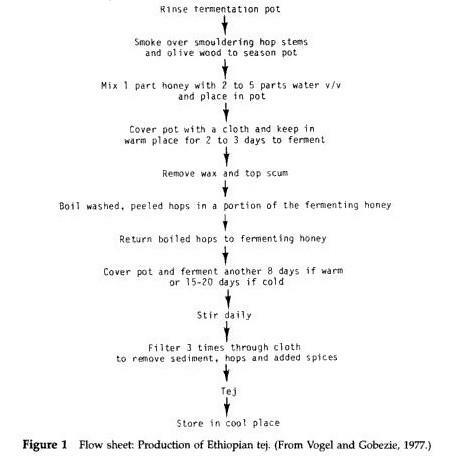 ♦ In 2000, the Chemical Society of Ethiopia sponsored a conference on Ethiopian alcoholic beverages and published a 160-page book, “The Proceedings of the Workshop on Modern and Traditional Brewing in Ethiopia.” The nine essays in the book, all based on papers delivered at the conference, include many references to and facts about t’ej, including this flow chart for the making of t’ej. The chart appears in the article by Ayele Nigatu and Kelbessa Urga of the Ethiopian Health and Nutrition Research Institute. ♦ In 1977, Sally Vogel and Abeba Gobezie presented their research on Ethiopian t’ej at an international symposium on fermented foods held in Bangkok. I can find no independent publication of their findings. But Keith Steinkraus’ Handbook of Indigenous Fermented Foods (see just below) has a summary of their work and reprints their t’ej recipe in the form of a flow chart. Google Books also offers a preview of Steinkraus’ book that includes the Vogel and Gobezie research and the the flow chart in the context of the book. Although he notes that Ethiopians use hops and spices to ferment and flavor their “home-processed honey wine,” he doesn’t specifically mention gesho as the fermenting agent. “Yeasts of the genus Saccharomyces,” he says, “are responsible generally for conversion of sugars to ethanol: no inoculum is used. Thus, the fermentation depends upon yeast present in the environment. The fermentation would very likely be improved if desirable strains of fermentative yeast belonging to the genus Saccharomyces were isolated and used for inoculum.” No doubt it would. But then, would it be true homebrew t’ej? ♦ This 2005 study, published in the African Journal of Biotechnology, looked specifically at the fermentation yeast in ogool, the honey wine of the Majang people. The study notes that ogool is fermented with the bark of a tree called the mange (Blighia unijungata) rather than the stems and leaves of the gesho plant used for t’ej. Having documented the yeasts active in ogool, the authors conclude: “Efforts are currently underway to research indigenous alcoholic beverages brewed in tropical and subtropical areas and to isolate useful microbial resources so that the methods and microorganisms used in their production can be studied and possibly applied to modern brewing.” In other words: Everything old is new again. Read the report (PDF format). One controversial assertion in his book is that bee culture came to Africa through the Hamites from Indo-Germanic pastoral culture. Later studies dispute this, saying that Africans learned to cultivate bees and honey on their own. The passage on “hydromel,” the generic name he introduces and uses most often (interspersing his text with “mead” now and then), appears on pages 88-102, followed by two pages of writing about African honey beers. He names dozens and dozens of cultures and countries, recounting quick anecdotes about their predilection for hydromel, and often sharing their special names for the beverage. Mead, he writes, is “the favorite drink of the Bambarra of Mali,” and the Moslem Hausa people of Nigeria, though forbidden by their faith to consume alcohol, drink mead anyway. The book includes a concise and informative map with a key that shows the three uses Africans make of potable honey and where they do it: some cultures drink pure honey water, some add honey to alcoholic beverages, and some add a fermenting agent to honey water to create honey wine. The largest cluster of cultures that do the latter is in Ethiopia. 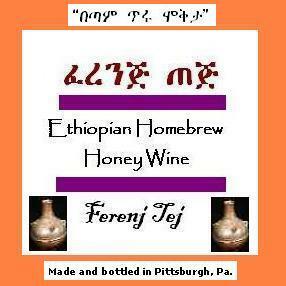 Seyffert calls Ethiopian honey wine tetsch, a common German spelling. The ruling Amhara “can’t live without it,” he writes, and it’s “a vice of the Galla” (the European name for the majority Oromo culture). As the national drink, he notes, t’ej is abundant and inexpensive. He gives recipes for making t’ej, talks about berele and other vessels for drinking it, and also about gesho for flavoring and fermenting it – all in all, a breezy and informative account of African honey wines, with Ethiopia and t’ej at its epicenter. Microbiological analysis have been made on two samples of honey (white and red) and on two samples of tecc, all coming from Ethiopia, with the purpose to isolate the yeasts responsible for the natural fermentation. 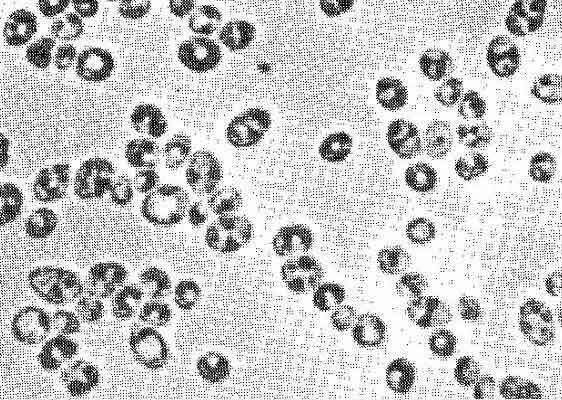 The study of the 84 isolated cultures showed an absolute prevalence of Saccharomyces ellipsoideus while Sacch. mangini were found with lower frequency. Hansenula anomala was found with particular abundance on the honey. We have also obtained some asporogenous yeasts belonging to the species Candida krusei and Brettanomyces bruxellensis var. non membranaefaciens. All the isolated cultures were capable of growing on substrata with high concentrations of glucose and, among them, Hansenula anomala showed the highest resistance. Many of the obtained cultures can be advantageously used for the rational preparation of tecc. ♦ Jon Abbink studies alcohol and culture in Maji, Southern Ethiopia, in his essay Drinking, Prestige, and Power Alcohol and Cultural Hegemony, which appears in the 1997 book Alcohol in Africa. He looks at three cultures – the Me’en, the Suri and the Dizi – discussing various local alcoholic drinks and how they define and influence power relationships within and between villages. “There are reports,” he writes, “that the Me’en and Suri people have their own honey wine, called boké, somewhat similar to the highlander drink t’adj, but it is difficult to say whether it was made independently or derived from the example of t’adj.” His essay goes on to discuss numerous brews of the Maji region and how they can bring prestige or derision to the people who drink them. Read the essay (PDF format). In the entry on “Drinks,” Abbink writes that “T’alla [homebrew beer] and Tägg are known under various names, differing according to language or ethno-region. . . Tägg is the typical Ethiopian honey-wine or mead, made of water, honey (and occasionally sugar in cruder blends) and a fermenting leaf (geso). In popular bars it was, and often still is, served in long-neck berelle, old perfume bottles, a custom dating from the late 19th cent. The best tägg is considered to be the filtered kind. Tägg or daadhii (in Oromo) has become the most popular drink of many Ethiopians, not only in towns but also in countryside bars. In parts of southern Ethiopia there are similar indigenous types of fermented honey-wine, e.g. boké.” The book’s chosen spellings differ from conventional ones. ♦ The downside of t’ej, and other alcohol, is the risk of dependency. One report on this subject mentions t’ej but attributes alcoholism in Ethiopia to other locally made liquors with a higher alcohol content. Read the report (PDF format). ♦ Honey, the key ingredient in t’ej and an important export product, has also been studied, often at length. A 2007 report, by Bayene Tadesse and David Phillips, mentions t’ej often and estimates that 70% of honey produced in Ethiopia goes to the making of t’ej. Presently, most of the honey harvested goes through a t’ej brewery channel. In this channel, many actors are involved at different levels. Yellow honey is usually preferred for t’ej and birz. Beekeepers directly sell their honey to local honey collectors (dealer or cooperatives) at district or zonal levels. Then, the collectors sell the honey to t’ej houses in their localities and/or transport it to the big honey dealers at Addis Ababa. The big honey dealers supply the honey to t’ej houses. Some collectors (e.g. cooperatives) also sell crude honey wax to t’ej processors from which they can make birz or use for coloring. Some beekeepers who are also producing large quantities of honey also directly supply to t’ej houses in their areas. Although economically not so significant, t’ej is informally exported through country visitors and transitory. All of this is part of the “honey sub-sector” of the Ethiopian economy, and the authors assert that “thousands of households are engaged in t’ej-making in almost all urban areas.” No doubt in many rural ones, too. ♦ In another study, researchers found that a lack of bee food during the dry season hindered production, although disease was not a problem. ♦ A 2009 dissertation from Ethiopia’s Bahir Dar University examined honey production in the Amhara region. Read the dissertation (PDF format). ♦ A study conducted in 2009 determined that “developing appropriate policy and beekeeping development strategy that would be applicable to the different production systems will ensure the sustainable development of apiculture sub sector.” Read the study. ♦ One scholar has studied resource management among beekeeping societies of South West Ethiopia. Read the report (PDF format).